A UK organisation that advises on vehicle safety has security tested 11 of the latest cars launched this year – it’s rated around half as ‘poor’. 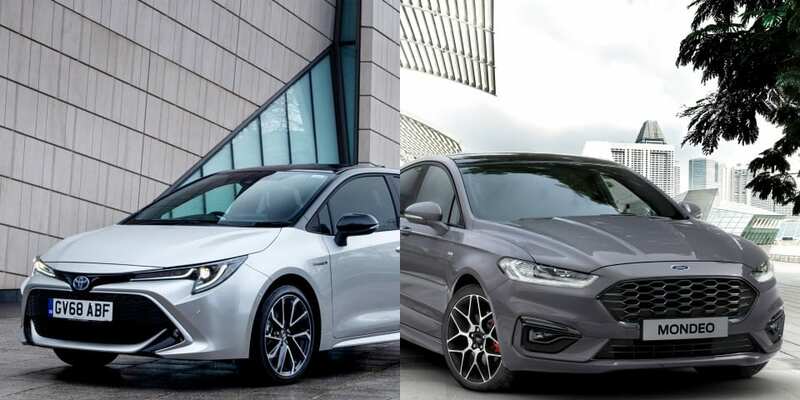 Five of the cars, including the Ford Mondeo, Toyota Corolla Hybrid and Kia ProCeed, had no security measures to prevent thieves from taking advantage of keyless entry and steal the car. The UK firm, Thatcham Research, has also launched a new security ratings system to help you find out whether your car is at high risk of theft. It hopes its new security ratings will incentivise carmakers to introduce measures to secure their vehicles against security flaws. Back in January, we reported that four out of five of the UK’s best-selling cars were easy to steal, as German testing body ADAC had found that 99% of the 237 keyless cars it tested could be easily unlocked and started by thieves. 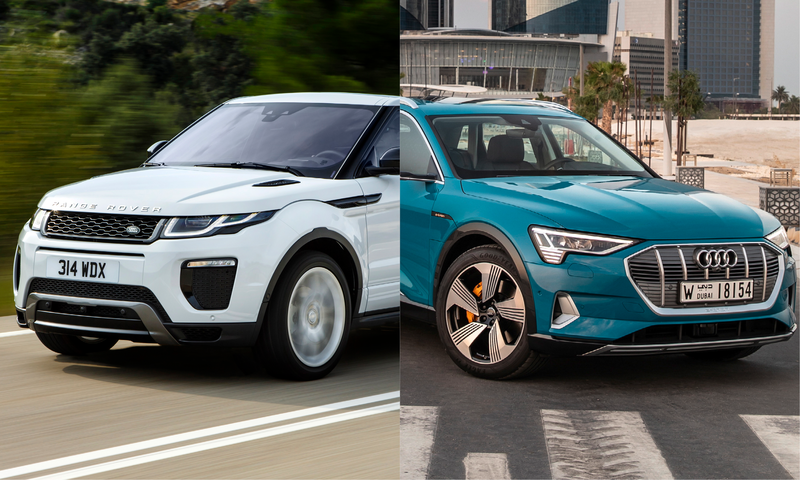 Keep reading to find out more about this latest batch of cars tested in 2019. 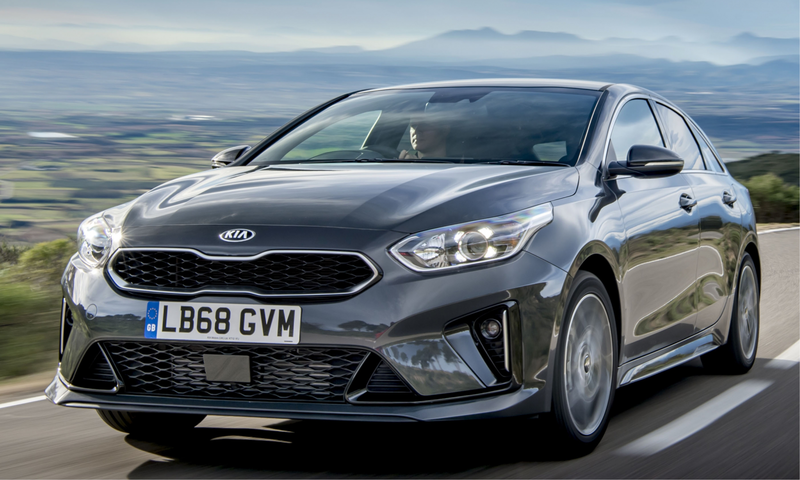 Our expert tests reveal which cars are safe, reliable and great to drive – see the best cars for 2019. 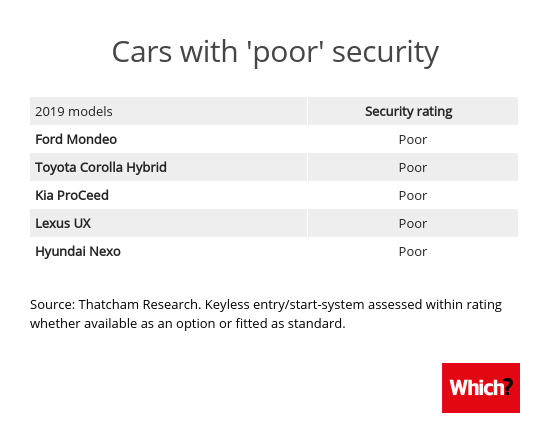 Which new cars have ‘poor’ security? Thatcham Research’s security tests found that even the very latest cars can have no protection from keyless entry theft. Updated 28 March: Thatchem Research updated the security rating on the Porsche Macan to ‘Superior’ – Thatchem’s said that new information around the specification of a motion sensor function on the key fob was provided by Porsche. Scroll down to find out which other cars were rated ‘Superior’. End of update. In its tests, Thatcham’s assesses the keyless entry and start system of the cars. It then assigns ratings to the cars. These ratings are: Superior, Good, Basic, Poor and Unacceptable. Which new cars have ‘superior’ security? The latest cars made by Jaguar Land Rover have fared particularly well in Thatcham Research’s latest security testing. 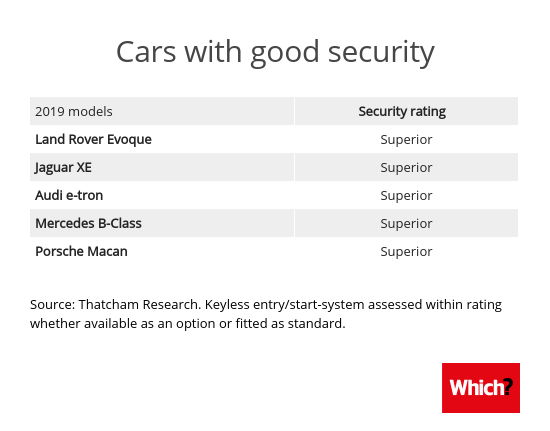 Both the Land Rover Evoque and Jaguar XE achieved the ‘Superior’ security rating. The Audi e-tron SUV, Mercedes B-Class and Porsche Macan also performed well in the tests. Why do the cars have ‘poor’ security? Five out of the 11 new cars tested were rated ‘poor’. This was due to having no security measures on their keyless entry systems to prevent the car being stolen using the ‘relay attack’ technique. The relay attack uses two relay boxes – one near your car and the other near where you keep your key. Thieves lengthen the signal produced by your car, fooling your car into thinking its key is nearby. On the tested models, keyless entry was offered as an option or as standard-fit. When bought without the keyless entry system fitted, the overall security features of the cars were classified as ‘good’. Chief Technical Officer at Thatcham Research Richard Billyeald said: ‘We’ve seen too many examples of cars being stolen in seconds from driveways. If your car does have a keyless system, check if there are any built-in solutions – such as whether it goes to sleep or if you can turn it off when you’re not using it. On older Mercedes cars, for instance, you can prevent your fob emitting a signal by double-clicking the lock button on your key. The latest Mercedes and BMW cars are equipped with motion sensors. These stop the keys emitting a signal when they detect it’s been put down. Thatchem Research recommends storing your car keys, including any spares, away from entry points to your home. It says this makes it difficult for criminals to tap into, or ‘relay’, the signal from your keys to the car. A Faraday shielding pouch can block the keyless signal. But only if it makes a completely effective block – many are designed for credit cards. It may also be possible to turn off the keyless system entirely – so it’s worth contacting your dealer to find out. A good steering wheel lock will also help deter thieves. Petrol vs diesel vs hybrid: which is better?